While some bands might take up to 18 years between albums, phonetically unchallenged psychedelic pop rockers MGMT won't let a little something like time stand in their way. Fresh off the success of their 2008 breakthrough album Oracular Spectacular, Brooklyn duo Ben Goldwasser and Andrew VanWyngarden have teamed up with Pete "Sonic Boom" Kember (of legendary drone rock outfit Spacemen 3) to record their sophomore album, tentatively titled Congratulations. "[The album] has an overall air of electronic exuberance, quirky instrumental introspection and their trademark soul-searching crescendos of psychedelia," Kember told NME. "They aren't looking to make Oracular Spectacular 1.2. Without a doubt the new album is broader in its sounds, arrangements and emotions than anything they've done before - it's set to be an avatar of its era." 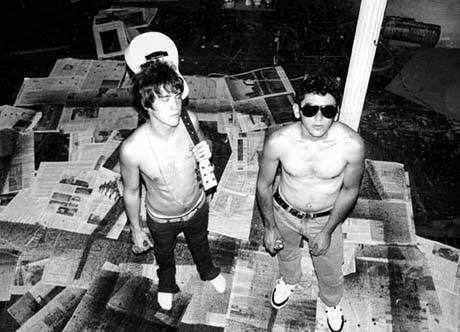 As fans may recall, MGMT's debut was helmed by long-time Flaming Lips associate Dave Fridmann; the sound and production of Oracular Spectacular indeed echoing of the Flaming Lips' 1999 release The Soft Bulletin, which Fridmann also produced. Since the demise of Spacemen 3, Kember has pursued numerous solo projects under various monikers, including Experimental Audio Research (E.A.R.) and Spectrum, exploring sounds and genres of drastically different natures, such as Memphis soul and Radiophonic-era synth pastorals. It was at a recent Spectrum show in London that Kember met the duo, and thus their relationship together commenced, as he began producing the pair's recording sessions in Malibu shortly afterwards. In recent months, MGMT have been previewing several new tracks at their concerts that may be featured on the upcoming album, including "It's Working," "Congratulations," "Song For Dan Treacy," "Destrokk" and "Flash Delirium." A release date has yet to be set for Congratulations, though VanWyngarden has said in past interviews that the album will likely be released in January of 2010.